But first, here is an important lesson. On Sunday I was up early for my run as our buyers were coming to measure up a few bits, and I didn’t want to wait until after. I had a lovely 6 mile run, but then when I got home I felt a bit rushed. I had put my fitbit (as usual) into the zipped pocket in my running tights, and usually I take it out straight away but I was in a bit of a hurry and just put them right into the washing basket. After our buyers left, I put on a wash, feeling very pleased with my efficiency. We headed out on a walk and it was part way around the walk that I had a horrible feeling- had I left it in my tights??? 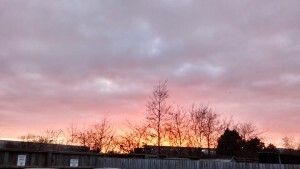 I had to wait for the washing to end, and yes, there it was. As I picked it up, the screen lit up, and I was able to scroll through the steps and distance (and I was amused to wonder how many “steps” a spin cycle earns you)- but then the battery ran out. No worries- I had not charged it for a week, so I plugged it in. And there is the lesson, because it would not charge! Whoops! 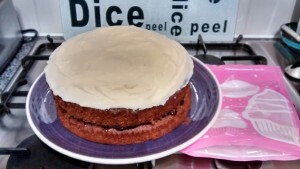 I made this cake to take around for Sunday tea- a red velvet cake (sort of chocolate) with cherry jam in the middle and cherry butter-cream on top. It was rather tasty. 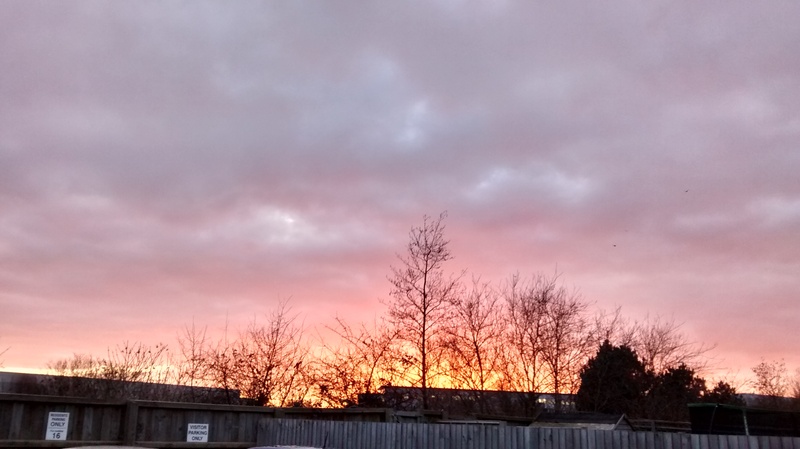 I had this beautiful sunset on my drive home on Monday- it’s lighter so much later now! Anyway, onto the post. 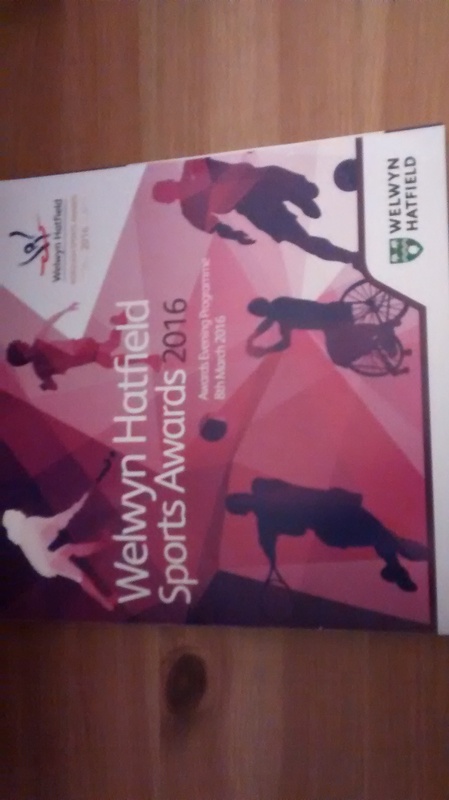 On Tuesday I was off to the local Sports Awards with some of my running club- some of the committee members were going, and with my “runner of the year” hat on I was invited too, as was the runner up. It was held in a local theatre, and even had a little buffet and drinks (apple juice for me- there was wine too though) before it started. 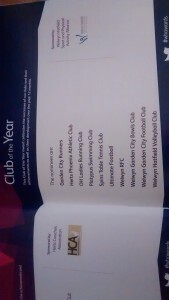 Our club was up for “Club of the Year”, and the leader was up for “Coach of the Year” too, so it was very exciting. I did wonder what it would be like, but I really enjoyed it. They had a few videos (Sport Relief, an Olympic montage, This Girl Can), and they whizzed through each award very quickly (there were a lot of awards!). They had a question and answer session with Chris Ryan, the GB “murder ball” captain, which was really interesting. 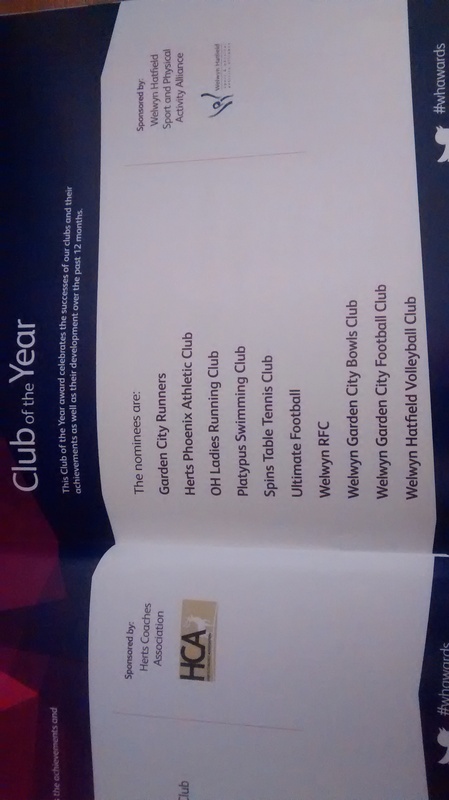 They also had an amazing video about a local swimming club who support disabled people. It was really inspiring. I loved seeing all of the school children get their awards, and finding out about local clubs (there is a women’s roller-skating club- not for me but what fun! ), as well as a hub for disabled people (adults and children) to experience activities such as trampolining, sailing, cycling and other sports. Even though we didn’t win, of course it’s the taking part that counts, and it was a great reminder of all the fantastic work that is going on throughout the district from volunteers, schools and clubs. The local paper did a little write up here. The council are also looking at holding a special event in October (10 days long) to encourage women and girls to become more active and involved in sports. We spent a bit of time talking about the local parkrun that our club are sponsoring (in part)- it has a launch date now, which is very exciting! There are lots of great things coming up in the club now- a new runner’s graduation at parkrun in a few weeks, lots of people running and marshalling a local half, a few of them running the London marathon for charity (lots of charity fundraisers going on), a virtual race for the charity…I am very very glad I joined! Author Maria RunsPosted on March 9, 2016 Categories Running, Stuff I love! Ahh the awards ceremony sounds like good fun. And how cool that there is so much support out there for kids and disabled people. Sports are a great way for people to get out there and get involved where they can. Uh oh about your fitbit – hopefully it’ll be OK?! I wear my Vivofit all the time…I’d hate for it to suddenly break. More than anything it’s useful as a watch! Well I did get the fitbit for free and much prefer my vivofit so I still have a step counter! It was great to see what is out there now to help everyone become more active. Can you email me a slice of that cake or something please? haha. I need to fix this cake craving that I have been having all week. Cake by email sounds like a very good idea! Gah! Rubbish about your fitbit! Will putting it in a bowl of rice help? I know that’s what you’re supposed to do with phones when they get wet. Previous Previous post: Another 50th parkrun! Next Next post: Finally a parkrun pb!